The Flesheater 5 Utility Bolo takes the Flesheater Design Group into the next dimension. With a sweeping 13” blade, this combat utility bolo with its radical, hand-molding handle provides the strongest Isshin-Ryu grip possible on a knife for extreme chopping applications. 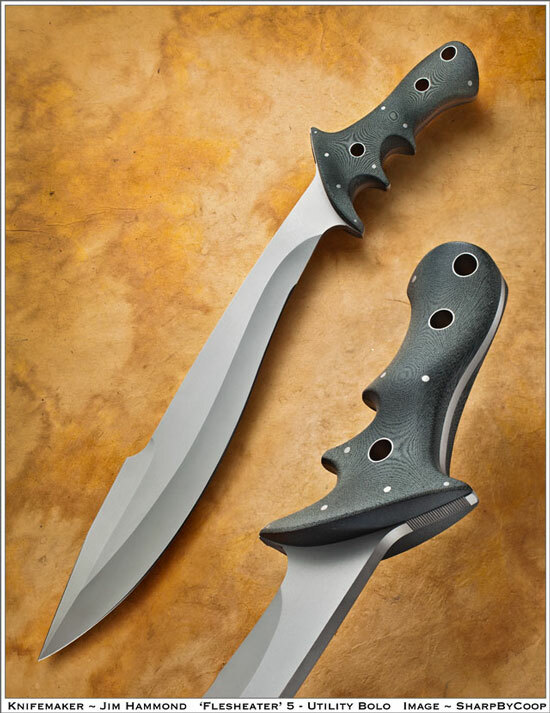 While maintaining its origin in the design elements of the Talibong from the Visayan Islands of the Philippines, coupled with the military concepts and applications learned with the 13” bladed bolo carried by Jim Advincula during his multiple tours in Vietnam, the Flesheater 5 combines proven old world working knife concepts with new world leading-edge technology. Utilizing a ¼” thick blade, its strong sweeping blade shape provides exceptional cutting performance with the primary edge while adding the secondary back-cut capability of a deeply hollow ground top grind with an extreme Navarro Hook™. 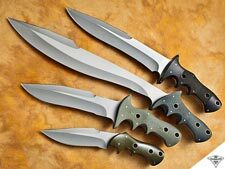 The handle utilizes a half-tapered tang rather than a full-tapered tang, as in the other Flesheaters, for greater grip stability with a broader handle platform for added palm comfort, which helps to dampen the shock harmonics through the handle during extreme use. Its coke-bottle shaped vertical profile, coupled with the proven Flesheater handle shape combine to produce the most secure grip possible in a knife for this application. Several cutting test videos shown on the ‘Videos’ website page show its cutting performance capability. One video shows Arcenio Advincula tossing a foot-long section of tatami mat into the air then cutting it completely in two with one slash of the Flesheater 5, showing the exceptional cutting capabilities of this specialized knife. Another cutting test video shows a more difficult rapid upward-slicing multi-cut sequence that decisively decimates another bamboo mat. Cutting tests were also conducted with a water-soaked tatami mat tightly wrapped around a core of green bamboo, representing a core of bone. The Flesheater 5 sectioned nearly vertical 7-8” slices in length through these particular mats. A fluid, flowing blade design with a radical handle shape of ultimate comfort and control, comprising the foundational elements of the standard Flesheater handle, makes the Flesheater 5 truly exceptional as a utility bolo. The Flesheater 5 kydex sheath is a partially enclosed edge-side breakaway design incorporating removable release exposure adjustment screws along that side. This allows for an opening adjustment between a full breakaway set-up to a more vertical extraction direction providing greater retention security during carry. Various carry and mounting options are available and may be fully reviewed on the ‘Sheaths’ website page.